MacArthur-Champion game moved from Friday to Thursday night in Boerne. Judson High School's football game at Harlingen on Friday night has been canceled because of the tropical disturbance expected to dump torrents of rain in South Texas this weekend. The game was going to be Judson's last tuneup before starting District 26-6A play next Friday at home against Steele at Rutledge Stadium. 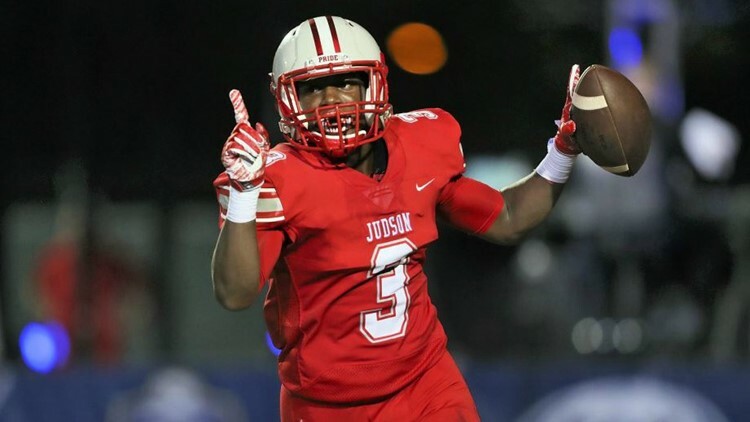 "Without a doubt, we all feel a letdown," Judson coach Sean McAuliffe said Thursday. "It kind of feels that we've been booted from the playoffs, really. "You work for a game and you don't get to play. It's unfortunate that the old weather wouldn't cooperate. But it's the right decision, particularly for us because it's a four and a half-hour bus ride. "At night, that would be tough if the rain comes down like they're predicting. It's just not worth the risk. But I feel bad for the kids because they work their butts off to have a chance to go play. Coaches put in all that work on the weekend. That's just how the world goes. It's the right decision. That doesn't mean you feel good about it, but it's the right thing to do." Judson was the only San Antonio-area Class 6A school to have its game called off on Thursday. The MacArthur-Boerne Champion matchup, scheduled for Friday night in Boerne, has been moved to Thursday. Kickoff is at 7 p.m. at Boerne ISD Stadium. MacArthur is the only North East ISD school that has changed its football schedule, athletic director Karen Funk said Thursday afternoon. "All the other schools are playing as scheduled," Funk said. Northside ISD athletic director Stan Laing and Brian Clancy, an assistant AD with the San Antonio ISD, said that their football schedules have not changed this weekend. Several other area football games, including the Central Catholic-Seguin clash, have been moved from Friday to Thursday. Central, scheduled to host Seguin on Friday, will be at home against the Matadors on Thursday night. Kickoff is at 7. Most of the schools from the Coastal Bend area to the Valley have moved their games to Thursday because of the heavy rain forecast Friday and Saturday. Floresville at Carrizo Springs, Thursday, 7:30 p.m.
MacArthur at Boerne Champion, Thursday, 7 p.m.
Medina Valley at Hondo, 7:30 p.m.
Seguin at Central Catholic, Thursday, 7 p.m. The Medina Valley-Hondo game was originally scheduled to be played at Panther Stadium on the M.V. campus.